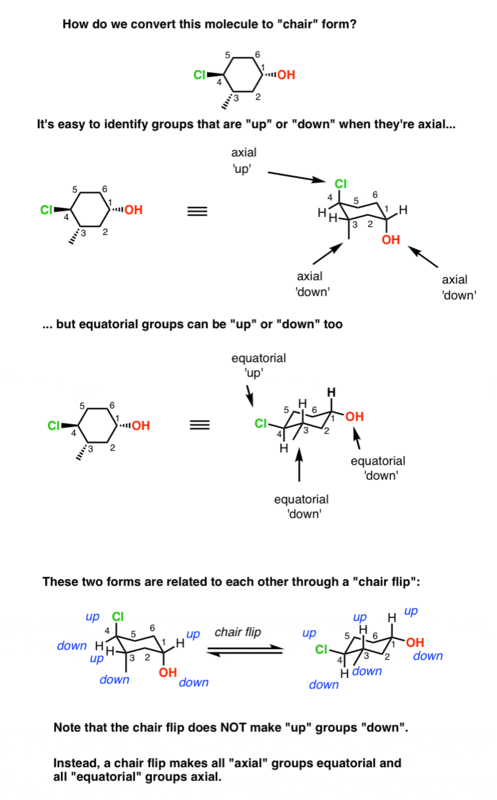 Cyclohexane Chairs: Equatorial Groups Can Be "Up" or "Down" Too! Drawing cyclohexane chair forms can be a tricky business. While it’s often intuitive to pick out which groups are up and down when they’re axial (i.e. pointing straight up or down), it’s tougher for beginners to see that equatorial groups (the ones pointing “somewhat up” or “somewhat down”) can be considered up or down too. I recall this as one thing that weirded me out when I saw cyclohexane chair forms for the first time. Equatorial Groups Can Be “Up” Or “Down” Too! Notice how the two chair forms in the figure are actually the same molecule. These two chair forms are related to each other through a “chair flip”. In the form on the left, carbon #1 (with the OH) is the “footrest” and carbon #4 (with the Cl) is the “headrest”. In the flipped form, carbon 1 is the “headrest” and carbon 4 is the “footrest”. But the Cl is “up” and the OH is “down” in both forms. The most important thing to realize with cyclohexane chair flips is that doing a chair flip does not make an “up” group “down” or vice versa. Instead, doing a chair flip makes every “axial” group “equatorial” and every “equatorial” group “axial”. Might be worth mentioning that equatorial groups are more stable than axial ones, too. True! Didn’t fit in here though. Soon! If they’re substituted with groups, it’s more stable due to 1,3-diaxial strain, a form of torsional strain.